Catherine appeals to Captain Beal and his fellow soldier, Wasif, for help in rescuing her father. Elsewhere, Brücke experiences a close encounter he did not anticipate. Last edited by GateWorld; February 14th, 2018 at 03:55 PM. I'm smelling a nice possible tie-in with SG-1's "The Curse", since the Goa'uld is revealed to be Isis/Aset in the Mission Files. really? weird, but Isis is dead in the curse, put in the canopic jars with Osiris thousands of years ago?? In addition to having Isis there breaking the SG-1 canon, I think it would be very unwise to use that character in a modern production considering the current connotations of the name. And so much for the canon. It's going to either be AU or memory wipe, if they want to call it canon. The next 70 minutes will tell, I guess. I paid for the subscription to support but this is pretty bleh. Not because it's low budget but because the story just isn't that thrilling and is fairly generic. A short episode of sg1 or atlantis characters talking in a room would have been more entertaining even. Canon has already been ruined as well seems like they were trying to combine the movie and series ideas in to one. The only thing I do like is the music they use as it's still they great music we came to love when watching stargate. Still trying to keep an open mind but I'm a little worried now she's actually gone through the Stargate. My hopes for a neater and less "mindwipey" ending have gone out the window. The Goa'uld planet set looked cheap too. The ribbon device effect also looked on the cheap end. They're showing the budget a bit. Still gonna keep watching, though. Hopeful it'll pick up a bit more. According to the Mission Files on Stargate Command, it's not Isis, but it is Aset. And according to Wikipedia, Isis/Aset is the same goddess, just a different name. Apparently Aset is her Egyptian name. Every member of the original expedition in 1931 died within a year of the dig. Then the ship transporting these artifacts to American sank off the coast of New Jersey six months later. Those deaths were attributed to mold spores that were released from the unsealed chamber. Mold spores aren't exactly front page material. No, I guess not. Er…if these things went down with the ship in 1931, how'd they wind up here? So 1931 is still before 1939. Yeah, screw the potential tie-in I was hoping for. And again, a continuity issue I don't see how they can resolve now, as Isis/Aset is supposed to be inside a canopic jar at the bottom of the ocean in 1939. Since she's only called "Aset" on the show, the apparent way to reconcile this with canon is that in the Stargate universe Aset and Isis are simply two different Goa'uld -- who eventually came to be confused by Egyptian culture. The baby depicted in this figure is Horus, who SG-1 fans will recognize as another name for Heru'ur. Teal'c identified Heru'ur as the son of Ra and Hathor ("Thor's Chariot"). But what if he was wrong about his heritage? He's associated with Ra on the one hand, and also in the story of Isis and Osiris on the other. But here's the kicker: One of many names associated with Horus (a.k.a. Heru'ur) is Harsiesis (Har-si-Ese, “Horus, Son of Isis”). Harcesis ... "Son of Isis." There'd been fan speculation for years that Heru'ur himself might have been a Harcesis, because Teal'c identified him as having two Goa'uld parents. If true that would mean that his Goa'uld parentage refers to his human host, and not merely his symbiote (as, say, Klorel was the "son" of Apophis and an unnamed "Queen Mother" -- possibly Amonet -- but not a Harcesis). But what if he was wrong about his heritage? Seriously though, I like this story/theory you dug up on Isis's, especially Heru'ur pedigree. Interesting speculation! Sadly it doesn't connect with anything SGO related if we accept the "Aset and Isis are simply two different Goa'uld" explanation. See the "Mission Files" on StargateCommand.co feeds/news. It says that the female Goa'uld is Aset and they gated to Abydos. Apparently, she's a minor Goa'uld "relaxing" on Abydos, subservient to Ra. 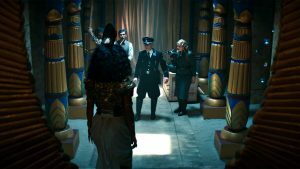 I guess by the time SGO ends, Aset (historically aka Isis, Osiris' mate) is killed/captured by Ra with Ra fully taking control of Abydos, maybe start constructing the pyramid atop the palace (noted the missing pyramid in this episode). Ever since I watched and re-watched Stargate series multiple times, I also (amateurishly) research real life Egyptian/Greek/Norse mythology. Based on what I roughly understand, which Egyptian gods is parents to which changes multiple times over time. This is attributed to one new cult gaining popularity over another over time and the new cult copy aspects they like of the previous god. Example are like Ra + Hathor = Horus and later changing to Isis + Osiris = Horus; cult of Anubis god of underworld losing popularity to Osiris god of underworld. So it is merely a matter of the SG1 writers cherry picking which mythology they like to adapt for the show. Hopefully this clears up some things. Cheers. Btw, if anyone here read the SG-1 novel "Moebius Squared", where current SG-1 meets time-stranded SG-1 from "Moebius, Part 2", stranded Teal'c and his human Egyptian girlfriend Aset flew off into the "sunset"(space) because his symbiote was the immature queen Egeria, founder of the Tok'ra. Wild theory here but could be she was captured and implanted with a new matured symbiote who took her name. Major problem here. The stargate stayed on for so long without anything or anyone going through. How is this possible??? That's not correct BTW. Her Egyptian name is Isis with a different pronunciation.She's called Ezees in Egypt. There has always been some story-telling leeway from episode to episode as far as how long a gate stayed opened with nobody going through. Granted, they kinda stretched it a little. But it's not like there's an exact time either. Same thing with getting shot with a zat gun... Sometimes you're out for a long time, some times you're not even loosing consciousness. I was already concerned with continuity, and after reading this thread, I realize that I missed a lot of it. I found that scene with Aset to be so weird. I understand that they have limited budget to create sets, but it felt strange that she was standing right near the gate with the baby. With that said, this was the most interesting episode of the three (not a ringing endorsement), so we'll see how it goes. Got provided provided with another theory that could keep Isis and Aset the "same" Goa'uld.... Cloning! Aren't we told she's a scientist/engineer/inventor? Perhaps she'll have developed similar technology to what BAAL will be doing many decades later. Just imagine the following: What if the canopic jars from the Stewart expedition were containing clones of both Isis and Osiris? Like a "backup" in case Ra would kill them. After all, theses jars were designed to keep the Goa'uld alive indefinitely. But then the gate on Earth got buried ~5000 years ago and nobody came back to reclaim/revive them. And somehow Isis and Osiris (the real ones) got killed between then and now. We may even get to see Isis/Aset's death in SGO. Last edited by jerem; February 16th, 2018 at 12:36 PM. Maybe a Rodney episode...BUT also a Keller episode!